There are many display devices which can be interfaced with microcontroller for output operations. One among them is 16x2 LCD display which is the most common output device. We dont use LCD library functions provided by mikroC compiler but we create our own functional modules for them. AIM:dAim of the project is to display our required string on the Lcd display. 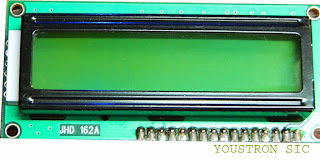 16x2 Lcd indicates it can display 16 characters per line and totally consists of 2 lines. Top view of Lcd is shown below. You can notice there are 16pins at the bottom of the Lcd. Pins DB0 to DB7 are data pins i.e whatever we want to display/commands on the LCD we send through these pins. We will connect these pins with port pins of a microcontroller and we send corresponding ASCII values. There is a difference between 'Command data' and 'display data'. Command data is used to give any command to LCD to perform it, example clearing display, cursor on, cursor blinking, start cursor at the first line, etc. Whereas display data is our desired data which has to be shown on the LCD screen , example hello , welcome etc. If we want to clear the display then we should send 0x01 to the data pins i.e DB0 to DB7. Similarly if we want to 'configure our lcd as 2lines' then we need to send 0x38. In the same way if we want to display any data on the lcd we send through these data pins. Suppose i want to show '8' on the lcd screen then we need to send its ascii value 0x38. Now you might get doubt that the ascii value of 8 and the command value of 'configure lcd' are both the same i.e 0x38 then which one will be performed by our lcd??? Your doubt is genuine, to solve these confusion for LCD there is a pin called as "RS" i.e 4th pin(look at the above pin table) if RS=0 then Instruction reg will be selected and if Rs=1 then Data register will be selected. If we want to give any command to LCD we make RS pin 0 and if we want to display any data we make RS to 1. R/W pin i.e 5th pin is used to read the data from the LCD or writing data to the LCD , in general we make R/W=0 because we perform write operation in most cases. For this purpose we use Array, we save string(which has to be displayed on lcd) in an array and then we will send the each character until we encounter '\0' which is the last letter in an array. //Below function will send the command to the Lcd. send_data("YOUSTRON");//calling function name 'send_data' to send string "YOUSTRON"
Verify the above code using proteus isis then proceed with the real hardware, if you dont know how to use proteus then check simple tutorial "Guide to Proteus Simulator for Projects"
I have a 16214 syh-ly 16x2 display that glows when powered up but does not show any characters. Please can you advise how I can test this.